Khushk Mewajaat se elaj is an Urdu book written by Hakeem Muhammad Azam Sufi. 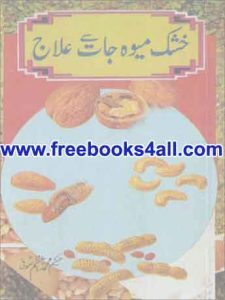 In this book the writer wrote the benefits of dry fruits and treatment with dry fruit. The benefits of using dry fruits for treatment such as almond, dates, peanuts, lemon, apricot, walnut and much more benefits are available in this book. The readers will read Lemon aab-e-hayat, Jaman, chohara, shehed, mong phalli, pista, thil, badaam, khobaani, ghegwaar, akhrot, loang, amaltaas. sonp, darcheni, arand, elayechi kalan, haldi, ispaghol, khashkhas, keekar, aalobukhara, phatkari, ananaas, injeer, peepal, neem, sars, anda, imli, angor, unaab, mirch siah, surkh mirch, taizpaat, namak, podeena, nareel, dhanya, retha, mehendi, tarbooz, chalghoza, aanola, khajoor, jaefal, lehsan, jalwatri, kela, khajoor, zeera, koza misri, alsi, daalain and much more in this book.